I love birthdays! Always have, always will! 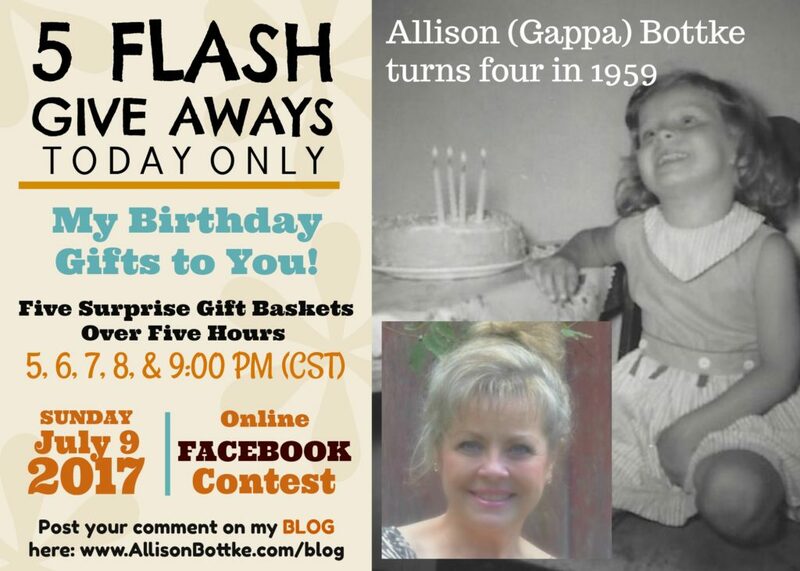 To celebrate mine, I’m giving away FIVE (5) Surprise Gift baskets TODAY! One every hour starting at 5:00 PM (CST). All you have to do to enter is submit your answer to the following question as a COMMENT on this BLOG. One entry per person per hour. READER QUESTION: What is one of your favorite birthday memories…and why? Lived in a highly dysfunctional family… Cannot remember one single birthday party but I can’remember a special Christmas gift that I got that I always had wanted… It was a Candy head doll… You could dye her hair and braid it… I absolutely loved it and still remember to this day!! So sorry about the lack of birthday memories, but how special that the Lord gave you a Christmas memory on His birthday! And one more thing, CONGRATULATIONS on winning one of the five surprise FLASH GIVE AWAYS TONIGHT! My favorite birthday memory, was knowing that when my father got home from work. He would give me $20 and take me to toys r us. We would spend hours, it was exciting! Ah your book Boundaries with adult Children was found at just the right time. Yay! For my 10th birthday, I got my own bedroom! Wow! You can’t beat that!!! And one more thing, CONGRATULATIONS on winning one of the surprise FLASH GIVE AWAYS TONIGHT! A special Sweet 16, how cool! Your Aunt sounds like she really cared and knew what an important milestone birthday this was! Another favorite birthday memory is knowing my mother would make whatever birthday dinner we wanted. our choice! Mine was always BBQ spare ribs! Mmm i miss my parent’s! Happy birthday! Birthday cakes, yum! My mom always baked one for each of us on our birthdays. Mom made birthdays special. Glad you have memories like that of your mom, too. And one more thing, CONGRATULATIONS on winning one of the surprise FLASH GIVE AWAYS TONIGHT! Wow, awesome! Thanku for sharing your birthday with me! My favorite birthday memory was when my then husband got together with our church friends and surprised me with a bus party. We had all went to a cascade, when everyone was on the return trip home the cupcakes came out! What a good memory. My favorite memory was on my moms birthday one year. My sister brought the cake in to show everyone. She had it at a slight angle. The cake slid off the tray into the floor. We didn’t have cake, but we all had a great laugh. I miss my parents so much. Happy Birthday! Another birthday ritual I loved was the birthday cake! My mother would bake us whatever kind of cake we wanted. I loved a yellow cake with chocolate chip and coconut frosting! Now you’ve done it! Now, I can’t get the tune out of my head! So good to have these kind of memories. And one more thing, CONGRATULATIONS on winning one of the five surprise FLASH GIVE AWAYS TONIGHT! What an awesome memory! How special! You must have been a great teacher! And one more thing, CONGRATULATIONS on winning one of the five surprise FLASH GIVE AWAYS TONIGHT! This year was my 50th birthday and we went to Hawaii. I have been to many beaches but never one with beautiful clear blue water. It was a difficult trip because one of my sons is having some health issues and he came with us, but I determined to enjoy every minute and I did. It taught me to live in the moment. When I was little a Birthday meant a party with all your cousins. I had many cousins which made it so much fun. We always had soda pop and cake. Each family brought a cake so there was a whole table full! I always had a new dress that my Mom made for me. Great memories!